Sometimes it's the little things that make us happy and bring a smile to our face, like these cute new slippers Robbie brought home for me yesterday! Hope you all find a little happiness in your day today. I made quite a bit of progress and am a little over halfway through with my second set of handmade Christmas gifts. I wasn't sure if we were going to have a family get-together this year, however I got an email from my sister saying they would travel up here if we could do a get-together at our home. We now have that on the calendar and everyone has been notified of the date and time. I met with my friend Iris to plan the invitation list for our annual ladies ornament exchange. I'll be printing and mailing the invitations in a couple of weeks. I purchased tickets for us to see the theatre production of How the Grinch Stole Christmas and also tickets for Robbie's birthday to see the Moscow Ballet perform The Russian Nutcracker. I also added a few things to my Christmas Wish List, although I mentioned one of the items (an embossing heat tool) to Robbie and he picked it up for me while he was out running errands today! These two weeks focused on the living room. I only had two projects that I really needed to do in the living room and I finished both of those. First was to remove all the cushions and vacuum the couch. The second was to wipe down the blinds – we have three windows in the living room, each one is 4’x8’ with wide wooden blinds. I think it’s been a couple of years since I actually wiped down each slat. The top of the windows is about 11’ from the floor so about ¾ of the work requires standing on the ladder. I cleaned the inside of the windows while I had the ladder out and dusted and vacuumed behind and under the couch and end table that had to be moved so I could get to the windows. So glad to have this project done! Another project I worked on was inventorying our VHS tapes and adding them to the Excel spreadsheet with our DVDs and BluRays. Now we have a complete inventory. We were able to declutter 30 tapes, most of them we had already upgraded to a DVD. These tapes will be donated to our library or community outreach center. We hang our coats and jackets on the top rung in our closet, which requires one of those extension rods to get down. I got them all down this week and Robbie and I tried them all on to see if there were any we could donate to a local coat drive. We only had one sweater and a nice vest for the coat drive since we had purged our extras last year. Two of our coats had small stains on them, so I washed them and all the coats are now hung back up in the closet. I also took out all my blazers and jackets (I love jackets!!!!) and tried them all on and checked to see if any needed to be cleaned. I am so excited that most of them can now be comfortably buttoned up since I’ve been exercising and eating healthier over the past few months! I did have two that I really don’t like (therefore I don’t wear them) and they went in the donation pile. I also tackled a mess in my craft room this week. Even though I had everything off the floor a few weeks ago, there were about 10 little piles (ok, some of them weren’t so little!) on my floor again. I’ve been wanting to rearrange some things on one of my bookshelves to make room for a few more magazine holders (which hold scrapbooking supplies not magazines in here) and put some of my plastic drawers on the floor next to the bookshelf stacked up, thus creating more storage space. (I know, I know we are supposed to be decluttering, but this is my scrapping room! LOL) I got that all rearranged and am very pleased with it. Then I worked on the other piles that just needed to be processed and put away. I listened to some Paperclipping Roundtable podcasts while I was working and the time went quickly. The Color! Or is it Colour? workshop at Big Picture Classes is underway! 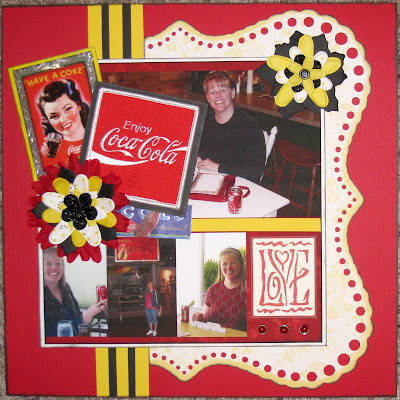 This will be my second Nic Howard class, and I am looking forward to creating many colorful layouts as well as learning more about color in my scrapbooking over the next six weeks. Each week we will create a two-page spread for a 6x6 Color mini-album, and we will receive step-by-step instructions for a larger Build-It layout. There's usually some bonus material as well. For example, this week there's a technique video on embossing and a printable color wheel handout. We are focusing on the color RED for week one. Here's my two 6x6 pages. Nic has provided a printable for the right hand page, and I have decided to choose a photo of me and Robbie wearing that color for each of the left hand pages. For the Build It Layout, I decided to do a layout about our home state, Texas. This past summer as we traveled I took some photos that I thought were distinctly Texas: the Texas flag flying below the American flag, cows in a field, an oil well, and some red, white & blue chairs in a Dairy Queen in some small town near the Panhandle. I also went back and pulled a photo from several years ago when we visited the Alamo and another of a field of bluebonnets. I started with a base of white cardstock and added two strips of Reminisce Passports Collection Texas patterned paper.I used a couple of old Stickopotamus stickers, some foam letters, and Spare Parts flowers with gem brads from Stampin' Up. The thin ribbon with stars is some very old RIBN-TAYP that I purchased from an elderly seamstress at a garage sale. I actually used more red in my layout than Nic recommended since she likes to use red as an accent color and to add an extra "pop" to a page. I am pleased with the way this layout looks and enjoyed having a red day today! As I mentioned in last week's post, today I want to share with you what's been happening with the scale. Today is the end of the ninth week of my re-commitment to a healthy lifestyle. For the past nine weeks, I have been exercising at least 30 minutes a day five or more days a week (an hour or more two or three days a week!). I have also cut back on my overall eating and am focusing on eating a more healthful diet. In addition, I stopped drinking Coca-Colas 26 days ago. Every week on Friday morning, I pull out the scale and weigh myself. Honestly, I don't like the scale and didn't even own one until about four years ago. I would rather judge my progress on how I feel and how my clothes fit. However, since I'm tracking everything else, I decided to also track my weight. The first five weeks of this adventure the scale read exactly the same thing every time - FIVE WEEKS! Each week I reminded myself that what I was doing for my health was more important than the number on the scale - and besides, muscle weighs more than fat and I was starting to see a little definition in my arm and leg muscles. I also knew I was losing inches (or at least fractions of an inch) as my clothes were feeling more comfortable. I have to admit, though, that at the end of week five, it was still a little bit discouraging. Finally at the end of week six, the number on the scale went down three pounds - YIPPEE! Now, after nine weeks of exercise and four weeks of monitoring everything I'm eating and drinking (and 26 days without a Coca-Cola) I have lost a total of 5 pounds. Overall I am very happy with this result, not so much because the number on the scale has finally gone down, but because I am feeling better, I have more energy, I am stronger, and my clothes are just slightly looser. As we are rapidly approaching the holiday season, next week I'll share my plans for continuing these healthy lifestyle changes through the next two months which will be filled with holiday festivities, birthday celebrations and some of my favorite foods. I've had a wonderful, productive day in my craft room today. I worked on some handmade Christmas gifts and then completed two layouts to share with you. I combined yesterday and today's True Stories prompts to create a layout about pecan pie. Yesterday's prompt was all about repetition and I wanted to create a layout about something I repeat, baking pecan pies every year for the holidays. Today's prompt was about writing letters, and I decided to write a letter to Grandma (whose recipe I use and who's been gone for over 9 years now). I wrote the letter in my journal then just tore that page out of the journal to use on my layout. I also included a copy of the recipe on the layout. It's almost time for me to pull out your recipe and bake a pecan pie. Ever since you've been gone, every Thanksgiving and Christmas I bake pecan pies. I bake one occasionally during the year as a special dessert for a get-together or if I'm just craving the taste. I always think of you and miss you when I'm baking a pie. I remember the first year I took over making the pies, when you were in the nursing home, no longer able to get around much. That first pie didn't set up and it was all runny when we cut it. I asked what I did wrong, I was so disappointed and wanted everything to be perfect (like I always do). You looked at me and simply said, "You have to cook it until it's done." Well, I've got it down now; and no matter where I am or what oven I'm using (gas or electric), I simply bake it 'til it's done. I had a wonderful time creating this layout and remembering Grandma sharing the secret to great pecan pies with me - just cook it 'til it's done! This week's Library of Memories Community challenge was to create a PLACES WE GO layout using 5-10 photos and a map. I created a two-page layout with photos from four visits to the Dallas Museum of Nature & Science over the past three years. I actually used 13 photos and did not use the map I had of the museum because as I started putting it all together the map really didn't fit into the layout. And one other piece of news today - I am excited that I was chosen as one of the Top 3 Favorites at Sketches in Thyme for my Coca-Cola layout. You can see the other favorites here. I added the award blinkie to my side bar - check it out. Today's prompt talked about using the alphabet and numbers as a starting point for journaling. I decided to "use the alphabet to direct my thoughts in a longer piece of writing on one subject." 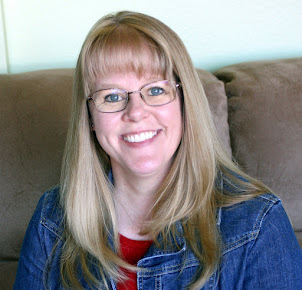 I journaled my thoughts about our life right now, and then I was pleasantly surprised as I was browsing some classmate's blogs to discover that Donna had created four digital page templates and shared them as a download on her blog. 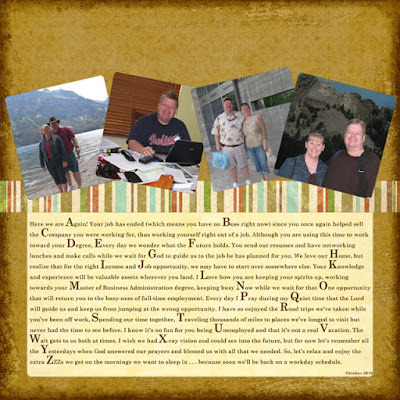 This inspired me to create a digital page using one of her templates, my ABC journaling, digital papers from JessicaSprague.com, and a few or our recent photos. Here we are Again! Your job has ended (which means you have no Boss right now) since you once again helped sell the Company you were working for, thus working yourself right out of a job. Although you are using this time to work toward your Degree, Every day we wonder what the Future holds. You send out resumes and have networking lunches and make calls while we wait for God to guide us to the job he has planned for you. We love our Home, but realize that for the right Income and Job opportunity, we may have to start over somewhere else. Your Knowledge and experience will be valuable assets wherever you land. I Love how you are keeping your spirits up, working towards your Master of Business Administration degree, keeping busy Now while we wait for that One opportunity that will return you to the busy-ness of full-time employment. Every day I Pray during my Quiet time that the Lord will guide us and keep us from jumping at the wrong opportunity. I have so enjoyed the Road trips we’ve taken while you’ve been off work, Spending our time together, Traveling thousands of miles to places we’ve longed to visit but never had the time to see before. I know it’s no fun for you being Unemployed and that it’s not a real Vacation. The Wait gets to us both at times. I wish we had X-ray vision and could see into the future, but for now let’s remember all the Yesterdays when God answered our prayers and blessed us with all that we needed. So, let’s relax and enjoy the extra ZZZs we get on the mornings we want to sleep in . . . because soon we’ll be back on a workday schedule. I am really enjoying the prompts for this class. I'm off now to try one of the other journaling prompts for today - making a list of numbers that describe one day or event or your routine. 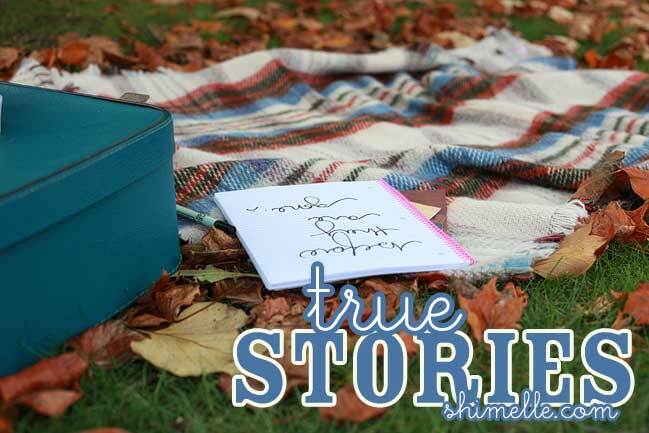 I started Shimelle's True Stories class today. It is a three week class focusing on writing our stories. The primary focus is on the writing each day, however if we feel inspired there are also sketches and sample layouts to spur our creativity. Today's prompt was to list questions that other people ask you and then write the answers. I created a layout about one of the questions Robbie and I get asked often. Journaling reads: People often comment that we are dressed alike or color coordinated and want to know if we did that on purpose. Yes, we actually take time to talk to each other in the mornings and coordinate what we're wearing. We like to be seen as a couple, like we are on the same team, together! And if one of us gets lost in a crowd, it's easy to remember what we're wearing. I journaled about a few other questions that people often ask me and they may make it into a blog post or layout sometime this week. I'm looking forward to tomorrow's prompt. I mentioned in a previous post that I had given up one of the true loves of my life as I pursue a healthier lifestyle. I created a layout about this love, a love that seems to have been with me most of my life. I don't remember a time before this love. I created this layout using the Challenge #20 sketch at Sketches in Thyme. 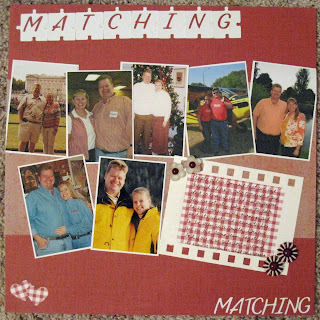 I printed my photo block as an 8 1/2" x 81/2" block using a red digital paper from Jessica Sprague. The Coca-Cola patch is from a trip to the Coca-Cola Museum in Vicksburg, Missisippi, back in 1997. Robbie had given me several extra Coca-Cola trading cards after he completed his set a few months ago, so I included one of those in my embellishment cluster also. The rest of the supplies I pulled from my stash: Bazille cardstock, decorative edge cardstock from Little Yellow Bicycle, rhinestone brads from My Mind's Eye, miscellaneous flowers and scraps. I can't remember when I started drinking Coca-Cola, but it has been a constant in my life as long as I can remember. Even in the 80s when I was a pre-teen, I knew that the company was making a mistake with that New Coke formula! Not only is this my favorite drink, it is just about the only thing I drank for many years. As I continue to make changes toward a more healthful lifestyle, I began looking seriously at that red can and wondering if the calories were worth it since it provides little (or no!) nutrients. I started noticing how often and why I drank a coke and discovered two primary motivations. HABIT - I realized that I was simply drinking a coke out of habit. When I get in the car to go anywhere that will take longer than 20 minutes, I grab a coke. When I sit down to scrapbook, I grab a coke. When I watch a football game, I grab a coke. When I have meal, when I go out to eat, when I'm cooking, when I'm reading, etc. I was merely having a coke out of habit rather than truly enjoying the refreshing taste of the coke itself. SOLACE - This is the reason I have decided to give up Coca-Cola for a while. I realized that when I became frustrated or irritated or sad or angry, I would reach for a coke. If something didn't go my way, I would reach for a coke. If someone hurt my feelings, I would reach for a coke. I was using that little red can full of sugar to console myself, to give me solace, to sooth my feelings. Wow - when I began to comprehend this, I was convicted to stop! I want to turn to the Lord (The Real Thing!) for consolation, for solace! So, for the past 20 days I have not had a Coca-Cola. I want to learn to turn to the Word and prayer when I need comfort, and until that becomes my new habit, I will continue to omit Coca-Cola from my day. Honestly, I don't believe I'll ever give it up for good. It is my favorite drink and once I feel I have broken these unhealthy habits, I can enjoy a refreshing drink on occassion, not because I "need" it but because I want to take time to enjoy it. How about you, is there something in your life that you turn to for solace? When I began transitioning how I store and process my photos and memorabilia to Stacy Julian's Library of Memories system earlier this year, I began with my 2008 photos because I had created yearly photo album scrapbooks for 2003 through 2006 and was in the process of creating one for 2007. So the logical choice for me at that time was to start the new system with 2008 and work forward. It has worked wonderfully and I love my new system for scrapping nonchronologically. Unfortunately, I never completed the album for 2007 and those photos and memorabilia where still in my closet where I stored them to get them out of the way while I worked to set up my new system. I have pulled some photos out over the past several months to add to layouts that included photos from various years and to complete a layout about our Christmas Brunch. I decided this week to pull out the partially completed album, the photo storage box holding all the remaining photos, my calendar, and the memorabilia folder and integrate these into my new system. However, I have noticed over the past several months that while I LOVE LOVE LOVE scrapping whatever inspires me and creating connections layouts, I miss having a chronological record of each year. So, I decided to create a simple one page layout for each month of 2007, then incorporate the remaining photos into my storage binders, category boxes, square punch drawers or cold storage boxes. I decided to use a simple layout dividing each 12x12 page into nine squares. I would have one square for journaling about the month and at least one square with a patterned paper to tie all the pages together. The remaining squares hold either a photo or another piece of patterned paper depending on how many photos I had to highlight each month. I used my Cricut to cut letters from Kraft cardstock for each month. Here are a few of the layouts. As you can see, I only added simple embellishments to each layout, typically just a few stickers or a rub-on. I also created an overview of the year layout using 32 square punched photos. I really like this system for having a chronological record of the year while still having most of my photos to scrap as I'm inspired. I am hoping to create monthly layouts for 2008 and 2009 in the next few weeks, chosing a different layout style for each year. I created a quick layout today for the Sketchy Thursdays 10-21 sketch challenge. When we were in Nashville in 2007, we stopped at Cooter's Place to check out the Dukes of Hazard museum and shot these photos of us with the General Lee. I really like how this sketch allowed me to highlight these two photos and how quick it was to put together. As I mentioned in last week's post, in my quest to live a healthier lifestyle, I am tracking everything I eat and drink each day. I simply have an old spiral notebook on the counter in the kitchen and each time I fix myself something to eat or drink I record what and how much. If we eat out, I add the information as soon as we return home. Several years ago, I met with the dietician at our doctor's office and she gave me some guidelines for eating a healthy diet. Foods are divided into these categories: carbs-starch, carbs-milk, carbs-fruit, non-starchy vegetables, meat and fats. She also gave me the portion sizes for the different categories and how many servings of each category I could eat for several different calorie counts. I created little stickers with small circles that I can fill in each time I eat a serving. I am currently using the criteria for a 1500 calorie diet. The dietician originally suggested I try between 1500 and 1800 calories a day based on my weight and activity level. I'm not really worried about getting everything perfect; I'm basically tracking so I can see trends in my eating. Most of the time right now I am measuring or weighing my food so I can readjust to good portion sizes, however when we eat out or I cook something like a casserole, I just guestimate the amounts. * I am drinking at least 48 ounces of water a day. * I am taking my multi-vitamin the majority of the time. * I often have servings of non-starchy vegetables "leftover" at the end of the day, thus I need to consciously try to incorporate more of these vegetables into my meals. * I rarely ever have starchy carbs or meats "leftover" at the end of the day. I only occassionally go over the recommended number of servings in these two categories, so I feel that I'm doing good there - especially since these are my two favorite categories! * I am only eating my two servings of milk carbs about half the time, the rest of the time I only get in one serving a day. I really want to try to be sure to get both servings in each day as these are such a great source of calcium. As you can see, none of this is scientific or perfect, just a simple way for me to take note of what and how much I'm eating so I can make adjustments as I strive to eat a healthy diet each day. Already over the course of these few weeks, I am making small adjustments just by being more conscious of what I'm putting in my mouth! I am continuing to stick to my strength training and stationary bike routines each week, occassionally adding in an exercise tape or DVD. Overall I'm very pleased with my progress over the past eight weeks. Next week I'll share my thoughts about weighing in and what the scale has to say about my progress. I created a layout today based on this sketch from My Little Sketch Blook. I also incorporated the October challenge at Scrapbookers Anonymous to "use a minimum of 3 different patterned papers from 3 different manufacturers." My background paper is from K & Company (the photo doesn't do it justice - it is a beautiful paper). The pink patterned paper that I used to mat my photos and the yellow swirl paper that I printed my journaling on are from Creative Memories. The polka dot paper was not marked so I'm not sure of the manufacturer. The journal block mat is from a We R Memory Keepers journal pad. The journaling reads: When I arrived at the hotel in New York, I worried because my name was not on the reservation and the hotel would not know where to find me if Robbie had sent me flowers. Then I chided myself about how truly spoiled I had become and that maybe he hadn’t sent me flowers since I was on a business trip and he was also traveling that week for business. Then I noticed these beautiful yellow roses at the end of the hotel check-in counter! I wandered over and peeked at the card and YES HE DID send me flowers, just like he always does when I travel overnight without him, even if it’s all the way to New York! I love incorporating memorabilia into my layouts as I did here with the florist's card and the two dried flowers. I was only in New York two a half days and I obviously couldn't carry this huge bouquet on the airplane, so I put two of the roses in a book and wrapped the vase in with my clothes. I left the rest of the bouquet in the sink at the hotel hoping maybe the maids would enjoy them! For those of you who have never heard the story about me and my wonderful hubby and the flowers, you can read all about it here. I am so excited that I completed one set of handmade Christmas gifts this week - a total of seven items in all. I added those to my Christmas gift box and updated my Christmas Gift List. I'm hoping to start on the next set of handmade items this week - I'll need to make nine of them. The kitchen was the focus for these two weeks of cleaning and decluttering. I cleaned both refrigerator/freezers and checked expiration dates on the condiments. I had two items that were past their expiration dates, otherwise everything looked great. The second refrigerator/freezer occassionally freezes up when the drain hole from the freezer to the refrigerator for the defrosting gets clogged up, so I also got that cleared again. I straightened and organized all the pantry shelves and wiped down the containers in our baking cabinet. I also reorganized the Tupperware drawers which seem to get higgly-piggly faster than any of the other drawers! We normally keep a pretty well stocked pantry, however I've been letting things run a little lower lately. I made a huge trip to the grocery store and stocked up on all the staples and a few extra baking supplies I know I'll be needing for the holidays. This is week ten of the Christmas Clutter Countdown, so I'm actually caught up and will be working on the living room this week! I have several projects in the works right now (handmade Christmas gifts, photo sorting, organizing memorabilia), but yesterday I just had the urge to create a layout. I had this great photo of my nieces, all looking up at someone with this quizzical expression on their faces. I knew I wanted to highlight it on a layout by itself. I pulled a piece of cardstock from my stash as the base and then used several patterned papers and round embellishments from Scrapbook Magazine's The Best Friends Collection that I've had in my stash for about a year. I added the blue polka dot paper from my scraps and completed the layout by adding some My Little Shoebox chipboard buttons to the center of the round embellishments. 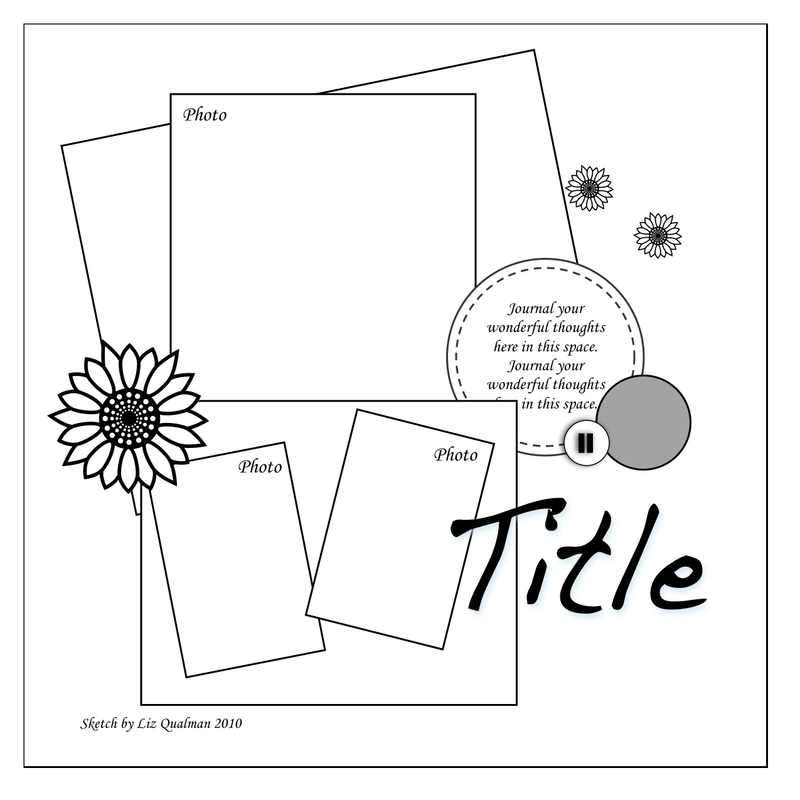 I had originally pictured this layout with bold colors and extra large title letters, however I love the summery look of these papers with this photo taken on a very hot July day. In my Healthy Living Weekly Post at the beginning of October, I set some exercise and nutrition goals for this month. Here's a restatement of those goals and an update on how I'm doing at the halfway point. I have completed my 30 minute strength training routine every Monday, Wednesday and Friday. I've ridden the stationary bike every weekday except the day we went to the Texas State Fair (five hours of walking around looking at exhibits and enjoying the beautiful weather) and the day I worked on some landscaping projects in the front yard (two and a half hours of trimming, hauling, digging, moving stones, and cleaning up). I have not taken a walk on Saturday as I had hoped, however one Saturday I did ride the stationary bike. The other Saturday I was at a retreat and spent a few hours after the retreat ended helping a friend catch up with grading papers. I've very pleased with how I'm doing on the exercise front. I can definitely feel my body getting stronger and even see a little definition in some of my muscles! I also feel good about the days I chose not to push myself to get in a workout when I'd already been pretty active or when I had the opportunity to help someone else. I am drinking at least 48 ounces of water each day and overall eating fairly healthy. At home, we are preparing very healthy well balanced meals, and we are visiting our local farmer's market once a week to pick up fresh seasonal fruits and vegetables. We are not keeping sweet foods on hand, so the few high calorie sweets I've had were a few of the oatmeal raisin cookies I made to bring to my Bible Study meeting and the chocolate covered strawberries and Dippin' Dots Robbie and I split at the Texas State Fair. I still need to add more fruits and nonstarchy vegetables to my meals each day and cut down on the starchy carbs so that I have more of a balance, however I feel good about my eating over the past two weeks. I also gave up one of the true loves of my life as I am changing to a healthier lifestyle. I'm working on a layout about that true love and hope to share it and the story about my reason for giving it up soon. I scraplifted the idea for this layout and the page design itself from Sue's Tall Ships layout. I love the way her layout looks and it reminded me of the photos I took in 2001 when I took each of my nieces and my nephew on separate trips to Galveston, Texas. I made the trip three times and enjoyed each one immensely. I purposely tried to take similar photos of each of the kids, although I don't have nearly as many photos as I wish from those trips - I was still using a film camera at the time. Isn't it amazing how many more photos we take now with our digital cameras! This next layout was inspired by this Sketchy Thursdays' sketch from the September 16th challenge. I didn't complete a layout for the challenge, however I had the sketch in my Inspiration File and pulled it out to create this layout. You can see that I didn't follow the sketch exactly but simply used the basic layout idea. I have lots of other ideas in my Inspiration File, hopefully I'll have a little time this week to try another one! I added two events to my December calendar, both of which I am really looking forward to. The first is the Annual Ladies’ Ornament Exchange that a friend hosts in her home. I will help with the invitations and also setting up the day of the event. I also ordered tickets for dear hubby and I to a performance of The Grinch Stole Christmas in mid-December. The focus for these weeks was on getting our yards and home exterior ready for the upcoming winter. We really don't do anything differently outside for the winter - we don't store our patio furniture, it stays out year-round; we rarely unhook the water hoses and bring them inside; and we don't need firewood as our fireplace is gas powered. I decided to take time for a few landscaping projects I've been wanting to do in the front yard. I spent several hours working in the yard and was exhausted when it was all done, but I'm pleased with my progress. I trimmed all the lower branches off the tree in the yard, trimmed both crepe myrtles and all the shrubs. Of course, I then had to tie up all the branches and put all the little items in a yard bag so they will all be picked up and taken to our city's composting center to be ground up. I removed the stones that formed a flower bed around the tree since we don't use that bed for flowers (or anything else). This took some work as the stones are heavy and then I had to wheelbarrow them to the backyard. I smoothed the area around the tree to fill in the holes from the stones. I then removed the stones from one of the front flowers beds - I really didn't like the way this bed was shaped, so I basically straightened it out and turned it back toward the house sooner. I had to dig a new trench where I moved the stones to and then haul the extra stones to the back. I filled in the holes with some of the extra dirt and smoothed it out. I had planned to move the stones from the flower bed on the other side of the sidewalk, however my energy gave out! I might get to it this fall, but if not that can be a spring project. I am happy with the progress I made and am very glad to have everything trimmed up before the holiday season! Plus, I got in a pretty good workout! This purple one-inch three ring binder is my Healthy Living Notebook. I picked this particular binder simply because it was available, something I had laying around the house that wasn't currently being used. I thought it didn't really go with my "healthy living" theme and that I might eventually purchase something different, however I love having this binder from SFA (Stephen F. Austin State University) because it reminds me of a goal that I accomplished - acquiring my master's degree. If I can accomplish a huge goal like that, then surely I can accomplish my goal of establishing and maintaining a healthy lifestyle. Inside the binder are several tabs: Motivation, Aerobics, Flexibility/Stretching, Stability, Strength Training, Toning, Fun & Adventure, and Sports. After the tabs I have a set of page protectors that hold my printouts from the Wellness Journey Workshop, one for each week. I printed Lisa's audio message transcript and the handout for the week and slipped them into these page protectors. I also have a few scrappy pages that I created during the Wellness Journey Workshop, like this page with The Wellness Pledge. I love having this book available to thumb through when I need a little motivation or want to try new exercises or activities. How about you, how do you keep yourself motivated to live a healthy lifestyle? I've done really well keeping up with my exercise this week and started tracking everything I eat or drink this past Monday. Look for an update on my October goals next week! The week four project was to set up a Christmas Command Center as a place to gather all the supplies you'll need for wrapping gifts and mailing cards. I already keep all my wrapping stuff together in my craft room closet except the Christmas wrapping paper and bags. Those are all in one box in the attic and I’ll get it down once I’m ready to start wrapping. I have all the supplies for mailing cards in my desk, therefore everything is located in one central area . . . so I really didn't have much to do for this task. 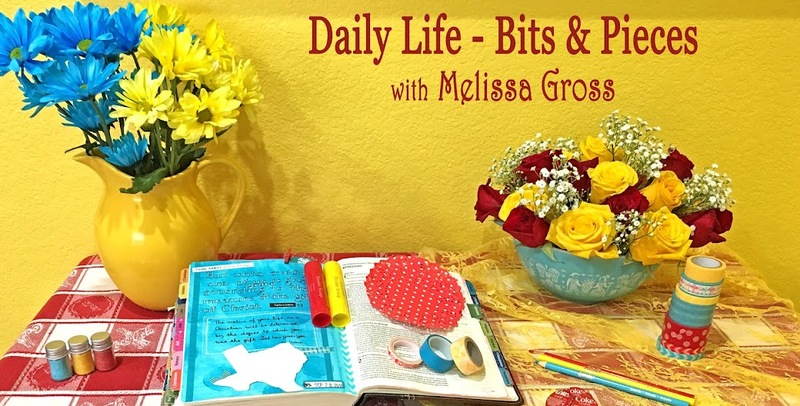 The week five file talked about the idea of “blessing gifts”, basically our attitude as we purchase, create, wrap, and prepare gifts for our friends and family. I love this idea, especially since I am making most of our gifts this year. I have times scheduled in my calendar to work on these gifts, so I went back and added the word “pray” beside each one to remind me that I want these gifts and the recipients to be blessed. The other item on week five's to do list was to create Wish Lists for family members. I printed out Wish Lists for me and Robbie so we can begin filling those out as things come to mind. We’ll exchange them at the end of October. We always buy each other entirely too much but we love Christmas morning and take time with each gift! For week 4, I worked on cleaning and decluttering our two hallways. The back hallway contains three short bookshelf units that hold our games. These shelves had gotten overcrowded and needed to be organized (and dusted!). I moved the puzzles from these shelves to the cedar chest in the front room (where we normally work on puzzles), emptied each shelf, dusted, and re-organized everything. A few items went in the donation bag - one puzzle and ten packs of playing cards. One broken game and one broken toy were thrown away, and a few miscellaneous items made their way into my scrapbooking stash (flat letters from the broken Hangman game and a set of playing cards). Robbie also brought in the 8-foot ladder and I replaced the three burned out bulbs in that hallway. The front hallway is narrower and does not have anything in it except our collage of family photos on the wall. I added a few photos that I’d been wanting to frame and updated a few of the photos. There’s a small closet in that hallway that is our catch-all closet and it was completely packed! I sorted through it and got it all re-organized. I moved the luggage rack to the guest room and a large candle to the TV/Exercise room. Several items went into the donation bag. There are quite a few plastic shoebox size storage boxes stacked in this closet that hold extra craft supplies. I recently re-sorted my scrapbooking supplies into color bins, so I want to sort through these boxes and add the items into my new system (or get rid of them if it’s not something I’ll use). For now, they are neatly stacked and all the random miscellaneous stuff in that closet is dealt with! For week five, I decided to tackle the garage. I park my car on one side and the other side we use for storage and a work area. That side has two sets of shelves and a work table along the wall. Normally most items are on the shelves with just a few things in front of them – my bike, the recycle bin, etc. However, over the past few months items had migrated out until there was only a small walkway between my car and the stuff! Robbie helped me and we got it all straightened back up. Several items needed to go in the attic, some needed to be moved to the shed, a few things we threw out, several boxes went into the recycling cart, and we dropped off two small bags of donation items to our local community outreach center. We also cleaned out our little 4x8 raised garden which was in bad shape after the terribly hot summer. We tore out the cantaloupe plant that was overtaking everything! We still have two tomato plants and a pepper plant that look great and might produce now that the weather is a little cooler. Everything we pulled out went in the compost bin. I am slowing but surely working my way though week 6 and will hopefully have a report on that soon so that I can concentrate on the week seven and eight to do lists! I was delighted back in August to receive this award from Sue. Yes, way back in August and I totally forgot to acknowledge it and add this award to my side bar. 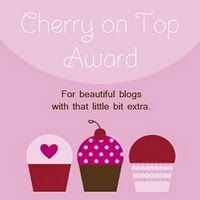 I love knowing that someone enjoys my blog enough to bestow this honor! Thanks Sue!! I mentioned in a previous post that I re-organized some of my scrapbooking supplies, sorting them by color rather than by type of item. I purchased bins similar to the ones Stacy Julian uses in her Scrap by Color system and sorted all my ribbons, letter stickers, buttons, brads, eyelets, fibers, glitters, flowers, thread, yard, bling, Glimmer Mists, and lots of miscellaneous embellishments into these bins which you can see here. As I scrapped a few layouts over the next few weeks, I realized there were some things that I really like to have right on my craft table in small drawers, mainly my flowers, brads and chalks. So, I took those few items back out of the bins and keep them in small drawers on the back of my craft table where I can easily grab them as I'm scrapping. Otherwise, I love having my supplies sorted by color. Some of my bins are pretty full while others have less, and I'm still working to arrange things to my liking. Here's a peek into a few of the bins. First is my yellow bin (of course) because it is my favorite color and it makes me smile to see all this sunshiny goodness together. On the left side of the bins, I have a page protector that holds miscellaneous paper accents - tags, die cuts, journal boxes, frames, etc. I have any new yellow accent packages in front of that page protector. On the right side, I have all my letters - stickers, chipboard, etc. I have a small basket in the front which holds small rolls of ribbon, glimmer mist and any other small items (which I usually have in small Ziploc bags). Behind the basket are larger rolls of ribbons, balls of yarn, Ziploc bags with ribbon pieces, lace, thread and bling. Some of my bins have a larger basket in the bottom and seem to stay a little more organized. Right now I'm just working with the system to see what I like and what I might want to change when I decide to take a break from scrapping long enough to change it. Here's a look into my orange bin which holds the least amount of supplies. It's easy to see which colors I might want to focus on when I'm shopping for embellishments. And one last bin for today, the blue bin, which has the largest number of items. I'm not sure if I just don't use a lot of blue in my layouts or if I somehow acquired an inordinate amout of blue supplies along the way. I may need to purge some of these items when I sort back through the bins later on, but for now I don't have to worry about running out to the store if I need something blue. Today completes five weeks since my re-focusing on living a healthy lifestyle. These past five weeks I have been focusing on getting back into the habit of regular exercise, and I am happy to report that I spent at least 30 minutes exercising 24 of the last 30 days! Part of my exercise is the 30 minute strength training routine that I want to complete three times a week. As I mentioned in my last Healthy Living Post, today I'll share with you what I do for this routine. I put this routine together using the basic exercises from the book Strong Women Stay Slim by Miriam E. Nelson Ph.D. and added in some flexibility and stability exercises from The Good Life by Ruth McGinnis, both books that I highly recommend. I originally tried the Strong Women Stay Slim routine back in 2007 and I had that routine in my Healthy Living Notebook (which I'll share with you next week), so I started again with that and added in other exercises between sets (and sometimes before and after) until it has evolved into this routine. I decided to try something new this month and pulled a quick exercise out of the September 2010 addition of Health magazine to add on to the end of my routine. I completed this extra exercise 8 times over the last few weeks. I am planning to pull a new exercise each week in October and add it to the end of my routine. (I won't continue to do them all, but will just do the ONE extra exercise each week.) If I think the exercise works well for me and I can perform it correctly, I'll add it to my Healthy Living Notebook so that I'll have a list of exercises to choose from when I am ready to create a new strength training routine. For the month of October, I will continue with my regular exercise but will be shifting my primary focus to my eating habits. I want to log what I eat and drink each day and continue to add more fruits and vegetables to my daily meals while decreasing fatty and sweet foods and drinks! As I begin to track how I'm eating, I will make my eating goals more specific and measurable. For now, here are my goals for October. Hope your October is off to a healthy start. Next week I'll share about the Healthy Living Notebook I have to store exercise how-tos, ideas, inspiration, and motivation.